If your are looking for sets, you are at the right place. We challenge to find anyone that has more vintage sets than Dean's Cards. 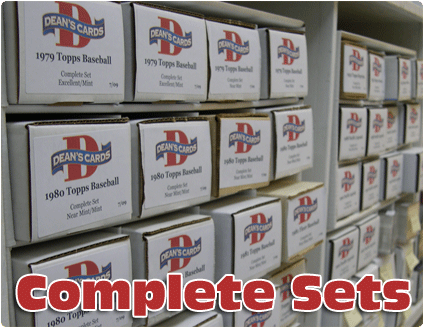 Dean's Cards offers a wide selections of Complete sets, Near-Complete Sets, Low-Number Sets, High-Number Sets, Starter Sets, Team Sets and Team Lots in most years and conditions. If a vintage baseball or football card set can be built, there is a great chance that it is available at Dean's Cards. Dean's Cards has a 100% Satisfaction Guarantee on all of the cards and sets for sale on our website. Dean's Cards grades on par with PSA, and the cards in our sets are very consistent. In order to create consistent sets, we use advanced technology to build each set from the ground up. Almost all vintage sets that are bought elsewhere usually contain cards that vary widely in condition. Click here if you want to SELL your vintage baseball cards to Dean.